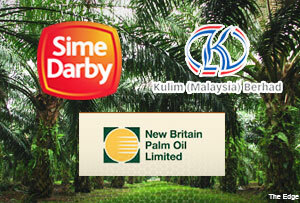 KUALA LUMPUR (Sept 30): Sime Darby Bhd has decided not to proceed with the planned acquisition of Kulim (M) Bhd's 49% stake in New Britain Palm Oil Ltd (NBPOL), Sime Darby said in a filing with Bursa Malaysia today. According to Sime Darby, the decision followed the expiry of exclusivity period last Sunday, under the exclusivity agreement between Kulim and Sime Darby. "Following the expiry of the exclusivity period under the exclusivity agreement between Kulim and Sime Darby on Sept 28, Sime Darby has decided not to proceed further at this time, on the proposed acquisition of Kulim's in NBPOL," it said. NBPOL is listed on the UK and Papua New Guinea (PNG) bourses. NBPOL owns some 77,000 ha of oil palm plantation in PNG. Downstream, NBPOL owns one refinery each in PNG and the UK. The group is also a sugar and beef producer in PNG, through its over 7,718 ha of sugar cane plantation and 9,282 ha of grazing pastures. In Malaysia, Sime Darby said in July this year that it was selected as the preferred bidder to acquire Kulim's 49% stake in NBPOL. The buyer and seller had 60 days to finalise the deal. Analysts were initially surprised at the emergence of the conglomerate as the preferred bidder, since other big plantation players such as Felda Global Ventures Bhd (FGV) and Singapore-listed Wilmar International Ltd had also bid for Kulim's stake. It was previously reported that even though Sime Darby was picked as the preferred bidder, FGV still remained interested in NBPOL and that once the 60-day exclusivity agreement had lapsed, there was nothing to stop other bidders from emerging. Today, Sime Darby was traded three sen or 0.3% higher at RM9.21 at 12.30pm, for a market capitalisation of RM55.9 billion.